Hornography Perth Metal Club - Opening Night! Home News Western Australia Metal News Hornography Perth Metal Club - Opening Night! 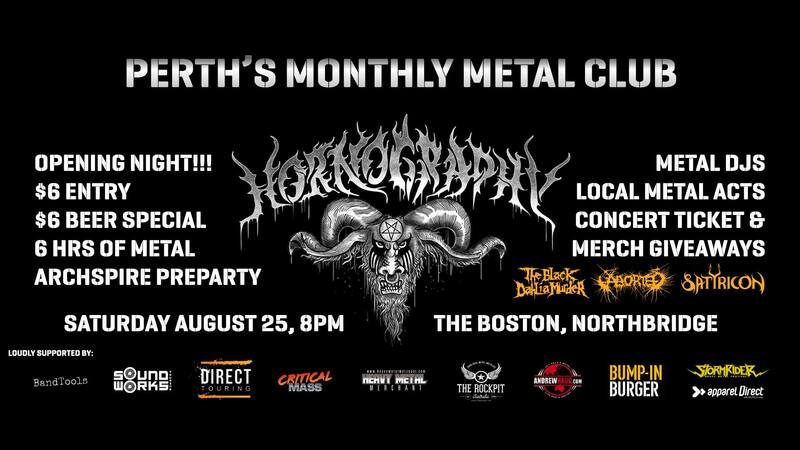 Hosted by The Boston in Northbridge, HORNOGRAPHY will be open on the last Saturday of every month from 8pm, so mark it down in your calendars! Bands, games, theme nights, guest DJs, competitions, stalls, HORNOGRAPHY will have everything to whet your metal palette. Guest DJ ‘STORMRIDER STU’ will be blasting the tunes, from traditional classics to modern hard hitters for every taste. Expect a focus on upcoming metal releases and tours! Plus, this is the official ARCHSPIRE Perth pre-party for the gig the next night! Giveaways include double passes to see The Black Dahlia Murder / Aborted and Satyricon! Don’t miss out on the grand opening of the latest Perth Metal Club, HORNOGRAPHY! Come early and party into the night.